My goal is the create a comprehensive resource of legitimate women only BJJ classes around the world; so, if you move or travel somewhere new you can easily find gyms with other women who train. If you don't see your school on the list and it should be, please let me know! We have women's only training (with instruction as well! )here in Fargo, ND at Fargo Brazilian Jiu-Jitsu www.fargobjj.com. Does that count? Nice to see this great list! Let's Roll in Torrance, Ca holds womens classes Tuesday and thursdays at 6:30-7:30. Also, renzo gracie New york has womens classes Tues and thursday 6-7. I love this idea! 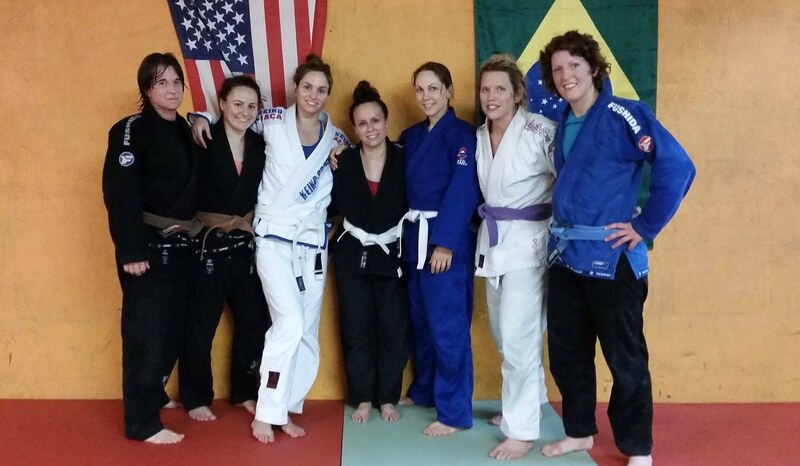 Excellent growing women's program here at Gracie Barra Vancouver. www.gbvan.ca Not only are there weeknight classes, but also a great turnout for Sunday open mats to continue working on our game. Great list! What a fantastic idea! I just opened Bridgetown Brazilian Jiu Jitsu in North Portland. My husband and Head coach Rex Payne is a brown belt under Master Rigan Machado and I'm a blue belt under Rex and 1-0 pro (MMA). We just added a women's only class on Friday nights at 7pm with hopes to add another one on Mondays. You can check us out at www.bridgetownbjj.com. Keep up the good work! Thanks Julia! You guys are officially on the list! Sorry it took me a little while. Nice site. I run a small academy in CT and have about 30% women. That would be 7 womeon out of 20. Thx. Will put a recip link on my site too. Great site! I own a school in millersville, Maryland www.bjjconquest.com we have a fantastic women's only class that has great instruction, I feel it is a great way to get more women involved with BJJ. Thanks Lance! I took a look at your class schedule and couldn't find the women's only class. Is there a page on your site I can put on here that will give more information about the women's program? Thanks so much! Hi there! I'm the Program Director at Marin Mixed Martial Arts (Marin MMA) in Marin County, just north of San Francisco. You can find information about our Women's Jiu-Jitsu class on our website at www.marinmma.com Hope this helps and thank you for putting such a great resource together! Hello Ladies, I just discover this blog and I am so happy to see all the places that offer BJJ classes for women only. Just wanted to add to the list a program in Tucson AZ, Daimyo Brazilian Jiujitsu, 2840 W Ina Rd, suite 136, Tucson AZ - If you happen to visit Tucson, Stop by the school! Yes! Added :) Thanks for reaching out! Hi there! RMBJJ Academy in Delray Beach, FL has an all women's class Mondays 5:30-6:30pm starting October 3, 2016. I attend their women's only class and would love to see more girls get involved and learn BJJ. Thank you! Added. Did I get the name / location right?